For nearly 100 years, the Marcellus Library developed quietly and sedately: the building, the resource collection, the programming all grew at a steady rate. For many years pen and paper were all that was needed to keep records of books and patrons, as well as for correspondence and information-sharing. A typewriter was surely a helpful addition to the librarian’s tools; it is not clear when the library purchased its first typewriter, but the first typed board minutes did not appear until 1985. Then, in the mid-20th century, technology happened! Electronic capabilities for information gathering, storing, and sharing exploded around the country. Libraries quickly realized that they would need to adjust their equipment and, to a certain extent, their style, in order to continue to be relevant to their patrons. The library’s first computer was bought in 1978 in order for the Marcellus Library to participate in the Michigan Inter-Library Loan program. From then on library staff and board have added many forms of equipment, have learned to use computers and other electronic devices creatively and efficiently, and have looked for ways to make electronic equipment available to the broader community. In 1996, a grant from the South West Michigan Library Network provided funds for the library’s first internet connection. It is interesting that in 1995, the librarian suggested to the library board that they purchase a typewriter for patron use, even though staff had been using computers for several years. The very next year the library was connected to the internet for staff use. Then in 2000 a major grant from the Gates Foundation provided funds for computers for library patrons. It did not take long for internet use to be made available to anyone who came to the library. In addition, the library generously arranged to have the wireless connection extend to the middle of the street outside the front door. Now people could pull up outside the library, at any time of day or night, to access the internet. When technology happens, constant maintenance becomes an issue. Upgrading is routine and frequent, requiring constant training and evaluation. Enter the Technician. 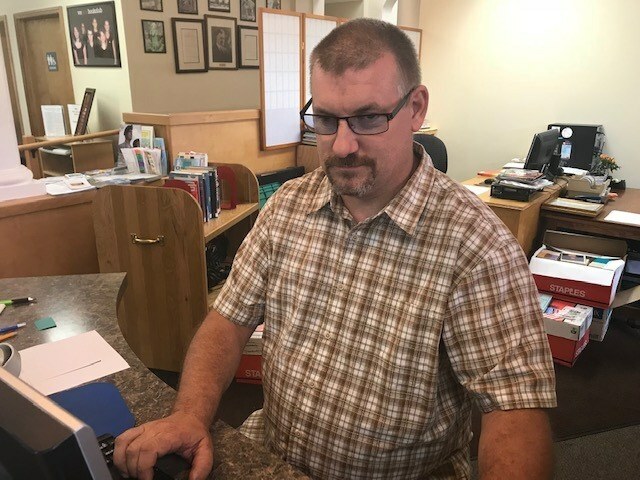 Since 2014 technological installation, development and training for the Marcellus Township Library have been provided by Alex Kowalski, an Information Technology Administrator based in Schoolcraft MI. Kowalski was first hired to upgrade and put in a new wireless router in 2014. This provided better speed for computer internet use, and allowed more patrons to have access to the internet. Other projects have included upgrading staff work stations, and training staff to use newer, faster Windows 10 programs. Kowalski has also worked continually to upgrade both staff and patron computers so that both equipment and people have the best possible security. The most recent upgrade installation and staff training for took place during the 2018 summer months, providing a new network with better quality access and optimum security for users. It takes time to maintain these systems, to keep them running smoothly, and to provide training for best performance. Over the years that Kowalski has been working with the library’s electronic systems, he has found himself increasingly interested in the role a library can play in a community. He also found himself donating more and more of his time, not wanting to charge the library for his ongoing supervision of the system and help with the problems which regularly occur. “Working in this library has made me feel like I am part of a good community,” he says. “I feel like I am giving back to this community some of what I have been given and expressing the value I place on helping people find and use information.” Kowalski estimates that he spends about three or four work days per month attending to library equipment needs, donating this time to make the library as useful as possible. “I asked my wife Sara what she thought of the extra, unpaid time I was putting in for the library, and she said that if it means a lot to me and is helpful, then it’s fine with her. So we both feel good about our connection to the Marcellus community and library,” Kowalski explained. Alex and Sara Kowalski live in Schoolcraft, where Sara owns and operates the Hair and Things Salon. A public library is no longer a place only for borrowing books; it can be a community center, providing a wide variety of services and programming that are useful for patrons who have library cards and for anyone else who needs to use electronic equipment, or needs help to know how to accomplish some of the many tasks of modern life. People come to the library to use the computer to: produce a spread sheet, file unemployment papers, file taxes, fill out job applications, prepare resumes, create programs for weddings or funerals or other events, book airline tickets, print out boarding passes, shop, create documents. They are also able to send and receive faxes, to make photocopies, and to do all the myriad things people do when they access the internet on their personal devices. They do, however, make and receive their personal phone calls outside the library! Some things, of course, never change at the library: Children (and adults) who are using the computers quickly learn to wear headphones, and to keep their voices low! In recognition of his professional skills, his many hours of unpaid work, and his attitude of community service, the Marcellus Library has awarded Kowalski an honorary library card. As a resident of Schoolcraft, he can’t technically apply for a card in this township! Now Kowalski can add checking out books and videos to his list of ”to-do’s” at the Marcellus Township Wood Memorial Library.